In North America, more than 50 percent of all domesticated house cats are considered overweight or obese. Unfortunately, this unhealthy epidemic is becoming normalized in our society. Consider a cat’s natural environment – living mostly outdoors, working for every meal. Compare that to an indoor cat’s day-to-day, then it isn’t surprising there are so many chubby kitties. Helping your overweight cat lose some extra pounds can be extremely impactful for their health. Excess weight adds strain on joints, and can also affect your cat’s organs, including the heart and liver. Just a few pounds of weight loss can greatly affect your cat’s longevity, as well as their overall well-being. 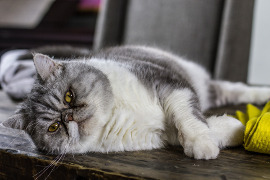 Figuring out why your cat is overweight is simple; it comes down to a combination of too much food, and inadequate activity. Calories in vs. calories out. The quality of their food is an important consideration; ditch the grains in favour of a more biologically appropriate diet. Cats are obligate carnivores, meaning they are designed to function best on a diet made mostly of meat. While some fruits and vegetables may have their benefits, grains should be off the table. Cats do not need any grains, however, many commercial cat foods are mostly grain-based. This increases the carbohydrate to protein ratio, and can cause weight gain more readily. Overfeeding a cat is very easy to overlook, and is the biggest contributor to weight problems. It’s much easier to overfeed a cat than most pet owners realize! Large portions, free-feeding, and too many treats can quickly lead to obesity. It’s in our nature to spoil with food, which is perfectly fine, as long as portions are reasonably sized. Cats are generally sedentary animals, spending much of their time sleeping or relaxing. Without having to hunt for their food, they have little reason to exercise. A major step towards helping your cat lose weight is encouraging a more active lifestyle. While this is easy to do with dogs, cats can be more challenging. There are many fun activities to do with your kitty that will both encourage exercise and strengthen your bond. Cats are playful animals; they just need someone to play with! Laser pointers and feathered wands are a fun and inexpensive way to get your kitty active. Interactive toys are a wonderful way to encourage some solo play time, and provide hours of fun. Battery-powered ‘cat and mouse’ style games will stimulate your chubby kitty’s senses, requiring no human interaction at all. For those up to the task, consider introducing your cat to a leash and harness, and taking your kitty for walks. They won’t like it at first, but with a little patience, many cats get used to leash walking over time. Cut those calories. Reducing your cat’s calorie intake is essential for weight loss. Be sure to check the feeding guidelines for the correct amount. In some cases, reducing their food too much may result in an angry kitty. In multiple cat households, the dominant eater is usually the chubbiest. While it’s not the most convenient thing, it’s best to separate cats during meal times. This way, everyone gets the right amount of food in a controlled environment. Get creative with your pet’s environment: add vertical spaces to encourage climbing and jumping. Leave a few healthy treats at the top to encourage exploring. Freeze-dried chicken breast is a good option. Tunnels, tents, and forts designed for cats are a great way to create a kitty playground. This extra stimulation is great for your cat’s mental health and well being, too. There are many different ways to help your cat lose weight, and what works for some cats, may not work for others. But one thing always remains the same: reduce their calories, and increase their activity. Cats tend to lose weight slowly, so don’t expect immediate results. Being consistent, and developing a long-term plan to encourage an active lifestyle is one of the best things you can do for your cat’s health.